272 pages | 19 B/W Illus. 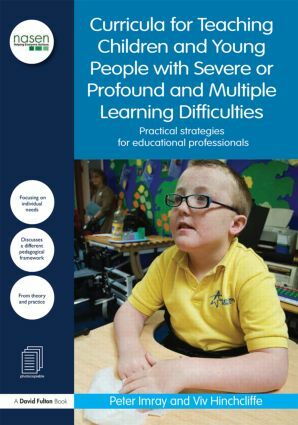 This highly practical resource is essential reading for any educational professional, parents, school governors, teachers, teaching assistants, therapists and indeed anyone involved with maximising the educational opportunities of those with profound learning difficulties. Peter Imray, now a freelance trainer and advisor, has been a teacher of children, young people and adults with special educational needs since 1986, mostly at The Bridge School in Islington, North London. He was part of the SCAA working party that published its findings on Profound and Multiple Learning Difficulties and the National Curriculum in 1996 and has been active in the continued development of learning difficulties pedagogy and curricula since then. His first book, Turning the Tables on Challenging Behaviour, was published by Routledge in 2008. Viv Hinchcliffe has held an interest in SLD and PMLD curriculum since his involvement on In Search of a Curriculum, published by Rectory Paddock School in 1983, and this has continued unabated. He has published widely on issues as varied as language and communication, self-advocacy, drama and leadership, is a regular speaker at conferences and has been a member of a number of DfE and DoH committees. Viv has recently taken up the post of Head of Drumbeat School and ASD Service, the new flagship specialist ASD School of the London Borough of Lewisham. The nasen spotlight series provides practical guidance and tried-and-tested resources for all schools and professionals involved in supporting Special Educational Needs. Written by leading experts and covering a wide range of important issues relating to SEN, the books include accessible explanations and examples of best practice, as well as tools and techniques that you can use to improve provision in school. Several new books are published each year to reflect your changing professional needs, and the whole series is brought to you by nasen, the leading organisation representing SEN professionals.